Flowers and plants in the hands of Lisa Toby Goodman suggest fragile mortality, but they never fade, wilt, wither, or die. Instead, the Berkeley artist photographs botanicals with intentional, expanded single exposure and prints larger-than-life versions onto wood substrates. Then, she applies a final coat of paint. The results boldly portray the duality of mortal life and its fleeting beauty. 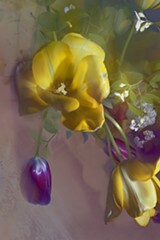 Exhibited at a flower shop, the images are otherworldly: Gigantic rhododendrons surrounded by mysterious swirls appear to grow underwater; tulips sprawl wide as if they are the sun, opening to reveal internal fire; curvaceous calla lilies wait like elegant cups for angelic, floating leaves to land. Goodman takes many of her photos near her home in Berkeley, which means visitors might recognize a plant or flower from their own yard. Regardless, the takeaway message is clear: All flowers live, decay, and die, but there is the opportunity to recognize and appreciate precious, lovely life in each one.